After a fantastic response from competitors to the announcement of two historic race Series to be run under the Historic Racing Drivers Club banner, the HRDC is pleased to confirm that its 'TOURING GREATS' race for pre-'60 historic touring cars is now complete with a fully subscribed, 32-car grid for the Series' inaugural race at Brands Hatch on 9th April. 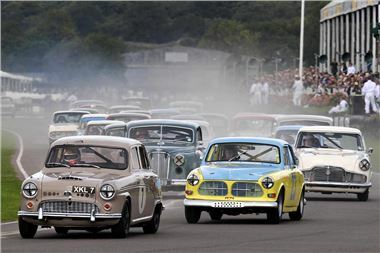 HRDC founder, Julius Thurgood, commented "This is what the competitors have been waiting for - a race series that has made a positive return to grass root values, run solely for the Competitors' needs - not the organisers. By listening to what competitors really want, the HRDC has come up with a format that brings back the camaraderie and spirit that I believe has been lost through organisers chasing commercial interests that do not necessarily place the Competitor first. The proof is plain to see - a full house for our first race, packed with a quality and diversity that would please any Revival crowd." The 32-car 'TOURING GREATS' grid at Brands Hatch contains a grid that includes what may well be a first for historics - three lady drivers! Nicola Kellet will be out in her rare 'Lowlight' Morris Minor, Victoria Beever will be contesting her first motor race with the I.K Classics-run Rover 105S and experienced historic racer, Louise Kennedy in her recently acquired Fiat Abarth 850. Both HRDC Series 'TOURING GREATS' and 'GRAND TOURING GREATS' (for sub-1500cc historic GT cars) will also headline the MOTORS TV televised race meeting at Mallory on the 30th May.